Joe wants to flee a belittling father, and convinces Patrick to get out from under the thumb of his embarrassing parents, so off they go to build a would-be man cave in the wild -- though the wild isn't all that wild being a hop, skip and a jump from the highway across which is a Boston Market. As their adventure begins, they run into an eccentric who claims to be an androgyne and who rarely speaks, though when he does, it's in a cryptic cipher. Jordan Vogt-Roberts's The Kings of Summer is a sweet idyll about that mysterious experience known as being a teenager. Steve Carell has perfected an endearing, naive character in a number of incarnations in recent years (The 40-Year-Old Virgin; Evan Almighty; Crazy, Stupid, Love), but in The Way Way Back, written and directed by Nat Faxon and Jim Rash, he's positively sadistic. Trent is step-father-to-be to Duncan, who would not be as clumsy and self-conscious were it not for the self-absorbed, sometimes callous adults around him. Duncan is on vacation with his family -- mother (Toni Collette), who knows damn well she should not be involved with a jerk like Trent but is anyway, and a sister who has her own insecurities. They have a beach town cottage next to Betty (a brash and boozy Allison Janney), and they party with Kip and Joan (Rob Corddry and Amanda Peet), fueled by pot and alcohol. No wonder the kid's depressed. But he finds an unlikely escape when he stumbles upon Water Wizz, a ramshackle, post-WWII-era kiddie attraction where he meets and, unbeknownst to his family goes to work for, ne'er-do-well Owen (Sam Rockwell) and a laid-back, loving staff. Liam James embodies Duncan's adolescent loneliness, its humiliations and its victories, with aplomb. "Unless someone like you cares a whole awful lot/Nothing is going to get better. It's not." James Ponsoldt's The Spectacular Now, adapted from Tim Tharp's 2008 novel, is set on the eve of high school graduation. If I may be permitted some armchair psychologizing, Sutter Keely suffers from atychiphobia. He so fears failure that he chooses not to take any risks -- if one excepts the voluminous quantities of alcohol he swigs every waking hour. He masks his fear and self-loathing with charming swagger. Coming to on a stranger's lawn he finds Aimee standing over him. Having just been dumped, he segues in to Aimee's heart as she tries to penetrate his armor. It is she who insists he should make a final demand of his mother to find out where his wayward father is. Emotionally that reunion does not get him what he wants, but it may get him what he needs. 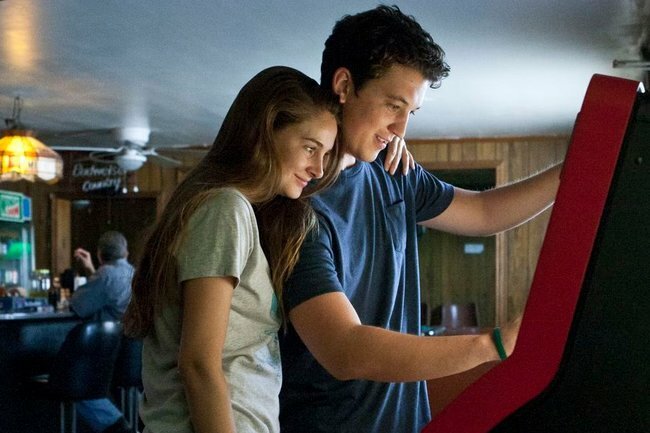 Miles Teller and Shailene Woodley as Sutter and Aimee and Jennifer Jason Lee and Kyle Chandler as Sutter's parents all deliver admirably nuanced performances.